WASHINGTON (CNS) — Pope Francis has named Bishop Emmanuel Challita of the Chaldean Catholic Eparchy of Addai of Toronto as bishop of the Chaldean Eparchy of St. Peter to Apostle in San Diego. The pope also named Bishop Frank Kalabat of the Chaldean Catholic Eparchy of St. Thomas the Apostle, based near Detroit, as administrator of Eparchy of Addai of Toronto. 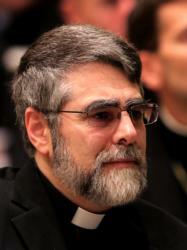 The appointments were announced in Washington Aug. 9 by Msgr. Walter Erbi, charge d’affaires at the apostolic nunciature in the United States. Born in the northern Iraqi city of Zakho in 1956, Bishop Challita studied at a Dominican seminary in Mosul and was ordained a priest by St. John Paul II in 1984 in Rome. He became bishop of Addai of Toronto in 2015. After receiving degrees in philosophy, theology and biblical theology at Rome’s Pontifical Urbanian University, he began his ministry in 1987 for the Eparchy of St. Thomas the Apostle of Detroit, serving in California and Michigan. Bishop Kalabat, 47, was born in Kuwait and grew up in San Diego. He began studies for the seminary at St. Francis De Sales Center in San Diego, and pursued theological studies at Sacred Heart Major Seminary in Detroit. He was ordained to the priesthood in 1995. His episcopal ordination and installation in Detroit occurred in 2014. Prior to his appointment as a bishop his assignments included associate pastor of Mother of God Parish in the Detroit suburb of Southfield, Michigan, 1995-2001, and, from 2001 until his episcopal appointment, pastor of St. Thomas Parish, director of vocations and director of the Center for Re-Evangelization. The Eparchy of St. Peter has about 65,150 Catholics and its jurisdiction extends to the western U.S. The Eparchy of Addai of Toronto has about 38,000 Catholics.